Rob Bironas would kick two field goals for Tennessee in the first half of play. On was a 42 yard field goal and the other was a season long 55 yard kick as time expired in the second quarter. The score was 7-6 in favor of the Texans at half time. In the 3rd quarter, Schaub’s deep pass to tight end Ryan Griffin is intercepted by Tennessee linebacker Akeem Ayers at the Houston 40 yard line and run back 5 yards. The Titans then move the ball down to the 11 yard line. Chris Johnson then scores on an 11 yard run off right tackle. It was the first take away turned into a touchdown by the Titans since the St. Louis Rams game November 3rd. The Titans would score again on a Texan miscue when Schaub fumbles the snap and defensive tackle Sammie Hill recovers for Tennessee at the Houston 33. After gaining 14 yards, Bironas comes on and kicks a 37 yard field goal to give the Titans a 16-7 lead. For Tennessee, Ryan Fitzpatrick made 15 of 24 attempts for 166 yards and one interception. Kendall Wright caught 5 passes for 50 yards. Nate Washington hauled in two balls for 39 yards. 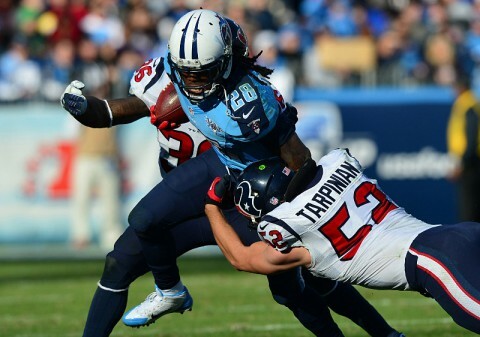 Chris Johnson ran for 127 yards and a touchdown on 27 carries averaging 4.7 yards per carry. He also caught 3 balls for 14 yards. This was his 35th career game with at least 100 rushing yards and his second in 2013. He went over the 1,000-yard rushing mark for the season during a 23 yard run at 1:53 in the second quarter. He is now the sixth player in NFL history to record at least 1,000 rushing yards in each of his first six seasons. He joins the company of Barry Sanders, Curtis Martin, LaDainian Tomlinson, Eric Dickerson and Corey Dillon in doing so. Johnson’s 7,965 rushing yards rank eighth in NFL history after a player’s first six seasons, trailing only Dickerson (9,915), Tomlinson (9,176), Emmitt Smith (8,956), Adrian Peterson (8,849), Sanders (8,672), Walter Payton (8,386) and Earl Campbell (8,296). The Tennessee Defense had two interceptions and two fumble recoveries against Houston, tieing their season high, set September 29th vs. the New York Jets, with four takeaways. Derrick Morgan recorded his 6th sack of the year. Morgan has 16.5 sacks in his four-year career. Matt Schaub went 22 of 34 passes for 229 yards and two interceptions for Houston. Ryan Griffin caught 3 balls for 49 yards. Andre Johnson had 6 receptions for 49 yards. Jonathan Grimes ran for 50 yards and a touchdown on 16 attempts. He also caught 6 balls for 76 yards. The Texans clinched the 1st pick in next May’s NFL draft with their 14th straight loss. The Titans get the 11th pick in the first round. In the second round, the Titans will pick 10th, the 42nd overall selection.